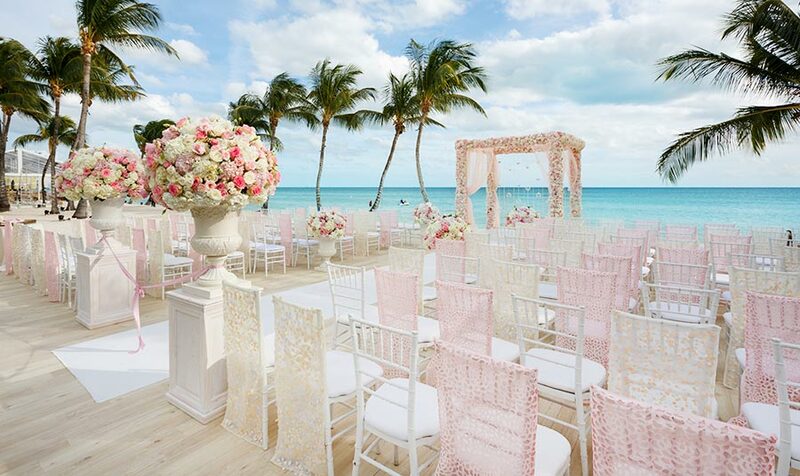 This romantic Caribbean beach wedding took place at the stunning ALBANY Resort in the Bahamas. The wedding ceremony featured an impressive pink and cream floral covered arbor, an array of lace and sequin chair backs, and a custom monogrammed linen aisle runner. Following the ceremony, guests enjoyed delicious sunset cocktails on the beach. A lively Bahamian Junkanoo troupe then led guests through hand-strung orchid curtains, into the reception tent, which featured blush rosette and gold metallic linens, white shell floral containers, and a stunning floral runner set on the couple’s head table. Following an exciting fireworks display, a series of gold glitter flares were set off for the newlywed’s “Grand Exit” moment to cap off this glamorous affair.